Much has been written about the strength and impact of women’s voices in corporate America and the level to which they are acknowledged and perceived. What we say and how we say it are critical success factors and key skills to refine and perfect. I would even go as far to say that how we present our message is an art which needs to be thoughtfully approached and practiced for maximum effect. As more women get promoted into leadership and executive positions, the next challenge and question is- how do we make certain that our input is heard? How do we connect and reach people to influence, motivate and inspire them? Given my frame of reference and experience as a leader over the last 28 years, I’d like to share with you some thoughts, ideas and suggestions on how to ensure that your voice is heard and respected. My background is deeply rooted in the area of communication both in the military and in leadership roles in a number of large corporations in the US. I served as a Signal Platoon leader during the first Gulf War and my main job was directing and projecting my voice to give orders and commands to a communications unit that deployed cellular networks on the battlefield. I also received extensive training on radio communications and protocols during hostile operations. This is where I learned the importance and value of being bold, being brief and being gone. The mantra that stuck with me was: “Be bold, be brief, be gone”. Make your point quickly and then be still. Speak, wait, listen and learn. After my time in the Army, I worked in various fields including Sales, Consulting, Project Management and Agile leadership, all of which rely heavily on strong communication skills to be effective. I have been an active member in Toastmasters International since 1994 and enjoy giving speeches and mentoring others to improve their confidence and communication effectiveness. Basically, I’ve been working on honing my ability to connect, articulate and transmit information, stories and messages to others since the mid 1980s. As a long time Toastmaster, I’ve been told that I possess a “Confident Command” when I speak. It is from this perspective that I present to you some tips and techniques on the topic of Powerful Speaking. Before you utter your first word at the table, on the conference call or at the lectern, take a long, deep breath and get grounded in your thoughts and intention. Relax your neck and shoulder muscles ( I use a technique of firmly pressing the palms of my hands together for 8 seconds- usually done under the table where I am sitting prior to standing for my presentation). Be mindful of your volume and pitch. Avoid a shrill sound which is often overly high and piercing in quality. Even tones and breathing are your friends. Practice your key foundational statements ( opening and closing) in advance so you can ensure that you project your message clearly and strongly. Back to the “Be Bold, Be Brief, Be Gone” mantra. Make sure that your main point is clearly stated up front and with power and conviction. Declare and proclaim the situation, facts and impact in a short 1-3 sentence statement of clarity and impact. Get their attention, connect and then elaborate on your point if necessary. Providing brief stories and examples can help support your point and knowing your audience’s concern and frame of reference is key to ensuring that your message is heard, understood and hopefully appreciated. Know your facts cold. This will help you deliver in a solid and unwavering manner. 3- Know your value and what you uniquely bring to the table. It’s not only what you say but how you say it has never been more true. “Don’t be wimpy. Don’t be whiny. Don’t be pissy. Don’t go postal. Another tip to have a good, solid tone is to tap into your Personal Power. Here’s an energizing quote that I read on DailyOm.com two days ago. When speaking from a position of balanced strength, our tone and non-verbal communications send the message that “ I have something important and valuable to contribute”. So take your seat at the table, speak up and let your voice and powerful message be heard! I hope that this article was helpful and connected with you in some way. Please send me your comments, questions and thoughts. This is Brenda Smull signing off. Over and Out. There is much on my mind. So many topics to talk about, so many things to say but lately my blog outlines and drafts are piling up on the shelf. Perhaps I have my first case of writer’s blog. Maybe I’m just too busy to finish and publish. Maybe I’m caught up in the intense tone of the nation when it comes to Freedom of Expression. 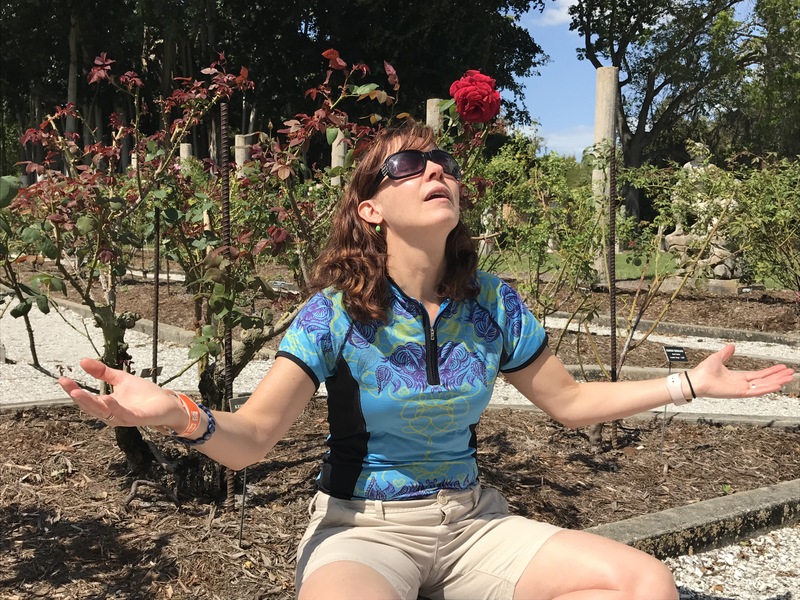 I’m not sure of the reason and I’m not big on making excuses so I thought I’d share with you some of the ideas and topics I’ve been tossing around for the last 6 months but haven’t finalized in an article, speech or blog. I’ll let you decide what you think is important, relevant or interesting. REI’s Force of Nature marketing campaign. Do we need a retail company to “help make outside the largest level playing field on earth”? Life is Spiritual Warfare. Words of wisdom from Tariji Henson. You have a seat at the table- Now what? Speaking with confidence and humility to land your message and make an impact. Sadly, the communication climate in the United States has taken an extremely negative turn since the election of Donald Trump in Nov 2016. Many people do not feel safe or comfortable with sharing their thoughts and opinions outside of their circle of like-minded “friends” and those that are voicing their ideas and concerns are doing so with such anger and intensity that the point of the message is not being received by those who need to hear it. Is this the reason why I’m not carrying through with my ideas on my WordPress blog ? I don’t know but I’m afraid to ask. Should some things be left unsaid? Getting healthy dose of quality communication with others and can do wonders for your soul. But how often do we get a full and balanced serving of it? Taking a vacation with a long time friend is fun and rejuvenating, especially when you can connect with the child-like spirit you once possessed. 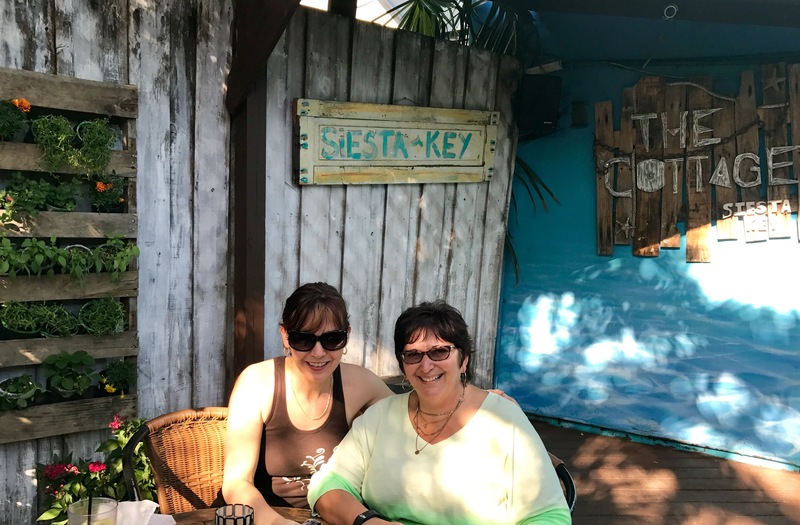 This year’s getaway was to the west coast of Florida and I was thrilled to have a three day road trip with my dear friend Andrea. Our time together was just what the doctor ordered and our interaction time was extended, genuine and authentic. We told stories, shared dreams and lamented the woes of the world. We were together and connecting without the use of an electronic device, just like we did in the 1980s when we met. I had full, balanced and delicious meals of communication that left me happy and satisfied. I can’t tell you how much I have missed live expression, eye contact and nuance in my connections with others. All the things we are lacking in our frenzied life of online interaction with what’s called the “Snackification” of communication, I got to enjoy and experience it in the flesh. Since it is the Lent season, Andrea and I have decided to give up Angst. Relaxing and restoring a sense of balance were our main objectives and I think we have met our goals. There are many different forms of communication in today’s online world: written (texts, emails, letters), verbal (phone, FaceTime) and social media (posts, blogs and tweets). To me, nothing beats good old fashioned face to face sharing. As I reflect on these last few days I can’t help but feel blessed and thankful for being able to spend quality time with good friends and family. This is what a full and balanced life is all about and I was so happy consume and savor my Soulful Serving! After hearing some groans and comments from the group about recent events, marches and demonstrations, the instructor gently reminded us that there are no politics in Yoga rather it is about centering and focusing. Yoga helps us balance and is about opening your body and clearing your mind. Wouldn’t this be nice if we did this in our everyday life? Being aware of the differences from all the different sides and viewing them with both eyes wide open and not filtering so strongly through our own biased lens. I view my life as a continuous effort to remain in balance. Opposing forces are always around us and we are often asked to pick or support one side or the other. But why? Why is there always a binary choice? Why is one side viewed as always right and the other as wrong? After my yoga class experience, an interesting and apropos book was brought to my attention by Steve Smull, a thoughtful and insightful writer, with his clever commentary and posts on Facebook. The book by Jonathan Haidt titled “The Righteous Mind” was published in 2012 and has an important and relevant message in the polarized and hyper-partisan world in 2017. My husband Steve created another insightful thread online this morning that ties into this theme and I’ll leave you with his words. “I view the world through both eyes. I have a right eye and a left eye. People who pick one to look through and close the other are missing depth perception. I suppose it’s simpler that way. I do close one eye when I look through a viewfinder to capture an image. But not before surveying the scene with both eyes open first. This week’s featured Tarot card is The Tower– tall and ominous with lighting bolts, fire and falling bodies. It is an unsettling card that matches the mood of the nation in this incredibly tumultuous and divisive US election cycle. It is card number 16 of the major Arcana and reflects a dramatic jolt and shift in direction. The Tower is a card of Change- the ultimate “ending the status quo” statement. Not everyone is a change junkie like me and many people find it disconcerting when a tsunami wave comes and wipes out carefully constructed sand castles (even if they were built on false premises). These sudden change experiences shake the very foundation of our current sense of security and force us to question our strongly-held beliefs, perceptions, attitudes and behaviors. In America today, a tower of change looms ahead of us and change is a good thing, right? But what if the change is a major disruption or crisis and is likely to bring chaos in its wake? Progress is sorely needed and dramatic change is required, even if it is unsettling. According to Joan Bunning in her book “Learning the Tarot”, “How you respond to the Tower’s change makes all the difference in how uncomfortable the experience will be. Recognize that the disruption occurred because it was needed. Perhaps embracing the change is too much to ask, but try to find the positive in it. In fact, you may feel tremendous release that you have finally been forced in a new direction”. 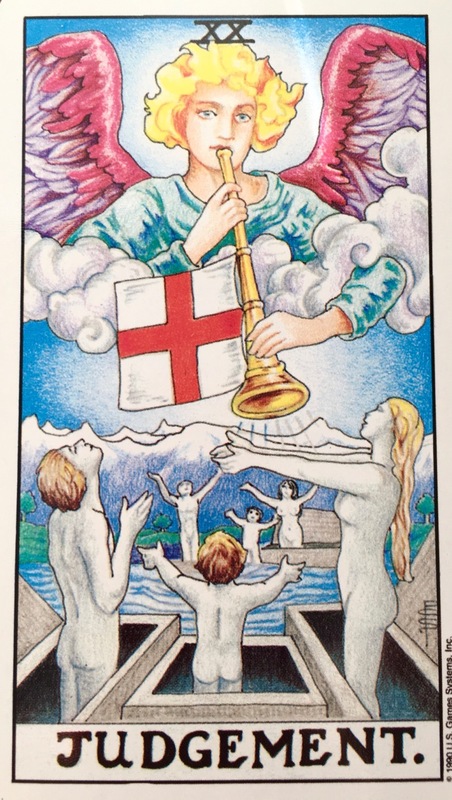 Note the symbolism in the Tower card below (from a traditional Universal-Waite deck). Two people are falling head first from a tower that has been struck by a bolt of lighting (truth). The man in red has crazy light colored hair and the woman in blue is wearing a crown. I can’t help but feel that these two characters represent Donald Trump and Hillary Clinton in all their falling-from-grace glory. It is clear to me that change is desperately needed in our country but did we really need to go to such destructive extremes? And so the menacing Tower looms, reminding us that a wave of change is coming. Resist the change and risk being snapped like a twig in the strong currents of a river. Accept the change we may not want or like and look for the positive aspects of it. I leave you with a final quote from Sydney J. Harris. 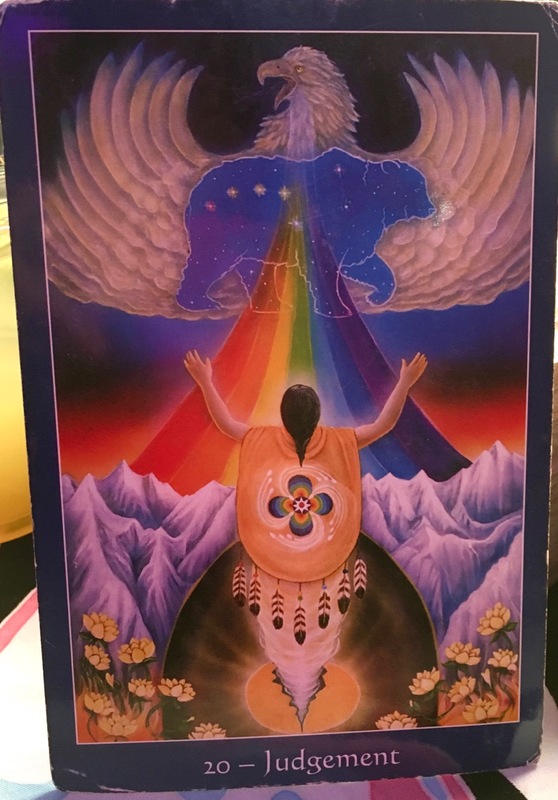 There is nothing like a good tarot card reading, a pending move to a new state and a bizarrely disgusting election news cycle to get me to look at things in an altered way. An Agile Life encourages us to have frequent Retrospectives to review what is going well, what is blocking us and what we can do differently. I view tarot cards as a mirror to the heart and soul and they often reflect thoughts and notions back to us in a new light. Below is a story about the Judgement Card, taken from the website Aeclectic Tarot“. “There is no way to leave the past behind,” The Angel observes. “Each step wears down the shoe just a bit, and so shapes the next step you take, and the next and the next. Your past is always under your feet. You cannot hide from it, run from it, or rid yourself of it. But you can call it up, and come to terms with it. Are you willing to do that? Are we able to resurrect the past, forgive it and let it go? Do we need to start something we’ve been putting off or have the courage to finally end something that isn’t good for us? As I bask in the glorious autumn weather of Colorado and watch the leaves turn to orange, yellow and red, I remember that they will all fall to the ground soon, dead but nurturing to the soil below. I also have faith that the leaves will be reborn in the spring as the seasons continue to roll by. It’s time forgive and move on to more important things.